NEW YORK, N.Y. - Emails from Mark Zuckerberg's Harvard days show the dropout-turned-Facebook CEO as a young entrepreneur losing patience with a client's delayed payments. "I contracted out my services for money, and even though I seem to continually be providing services, I don't seem to be receiving money from you guys," he wrote Sunday, Jan. 25, 2004, according to court documents filed Monday by Facebook's lawyers. The deal, writes Zuckerberg, was for $18,000, plus a side project for $1,500. He was still owed $10,000. Zuckerberg founded Facebook the following month. 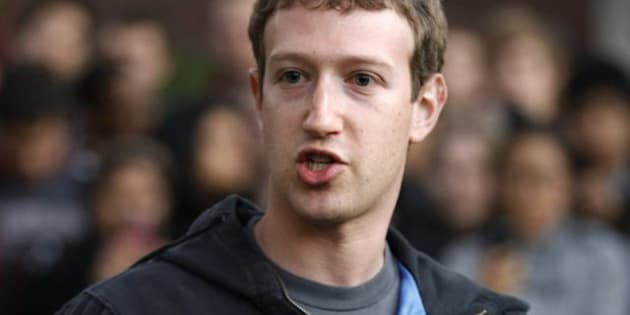 The client, Paul Ceglia, sued Zuckerberg in 2010, claiming that a contract he signed in 2003 entitled him to a 50 per cent ownership stake in Facebook. If Facebook's upcoming initial public offering goes as expected, that could amount to as much as $50 billion. Facebook's lawyers are seeking to dismiss the suit. They say the contract is a fake. Facebook included email exchanges between Ceglia, his associates and Zuckerberg in court documents filed in a U.S. District Court in Buffalo, N.Y., on Monday. Facebook said the roughly 300 emails it obtained from Harvard's servers relating to the case make no mention of Facebook. Instead, the emails centre on a database company called StreetFax that never took off. The two traded messages on technical specifications of the website that Ceglia had hired Zuckerberg to work on, and payments. The emails show a range of exchanges between Zuckerberg and Ceglia, which were sometimes terse and at other times lengthy and detailed. "I will do my best to try to raise the cash needed to pay the amount requested though I honestly cannot guarantee it," wrote Ceglia on Feb. 22, 2004, according to the filing. A day earlier, Zuckerberg wrote that he did not think Ceglia would pay him "at any point in the near future." In addition to losing patience with his late payments, Zuckerberg tells Ceglia's colleague in one email that StreetFax is not a very high priority for him, given that there are "many other things I'd like to, and have started to, work on." "I am at a school surrounded by some of the smartest people in the world, cultivating ideas and constantly coming up with projects to work on," he wrote in January 2004, just days before launching "Thefacebook," as it was then called. "The last thing I need right now is someone calling me twice a day asking if I've uploaded some small changes to a site that I made eight months ago ... My time is valuable, and seems better spent on things that I know, or at least can reasonably expect, will produce some sort of gratification in the near future." The last email, from May 2004, shows the two men may have worked out a payment plan, where Ceglia would send $500 a month until his bill was paid in full. It's not clear if the payments were actually made. Ceglia's lawyers said that Ceglia deserves his day in court where a jury will decide the ownership dispute.